It’s time to put an end to Blue Badge Theft. Every year thousands of Blue Badges are stolen from parked cars. As a result, while waiting some time for a replacement badge, owners can be left in a difficult situation, unable to park nearby. Blue badge protectors have been designed to protect your badge while on display in your car. This highly visible deterrent can help save all the hassle and stress associated with your car being broken into. Choose from single or double versions. 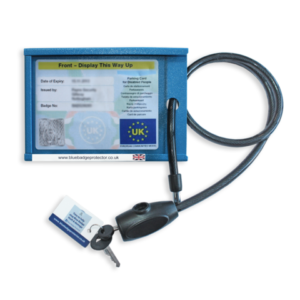 (We stock the larger double version to hold the new integral blue badge/timer). The single version locks your badge, keeping the timer loose on the dashboard. The double has room for both badge and timer. 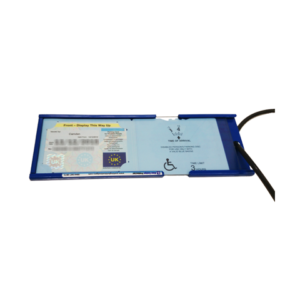 Your Badge (and Time Clock) are locked into a steel case & protected by 5mm thick clear plastic. The sturdy lock & flexible steel cable attaches the case securely to the steering wheel. Simple to use and gives peace of mind. We offer a range of wallets made by the Blue Badge Company, both fabric and leather options are kept in stock. 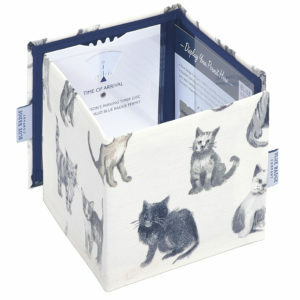 Choose from plain fabric colours or fun and attractive designs for a personal touch. You will also find the standard black leather wallet and deluxe leather versions in store. 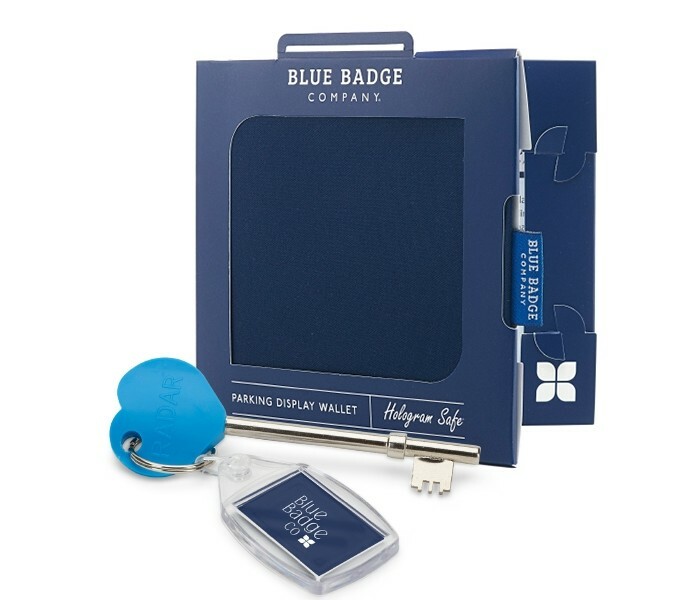 All make great gifts for those who hold a blue badge. 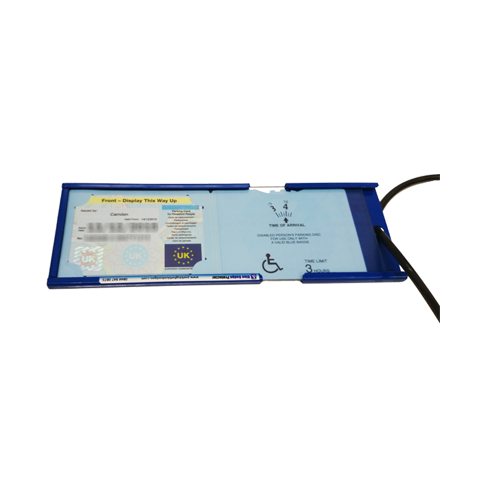 These exclusive hologram-safe wallets comply with Department of Transport guidelines and store, display and protect parking permits. Most come with a free timer clock. The RADAR Key Scheme or National Key Scheme (NKS) offers disabled people independent access to locked public toilets around the country. Toilets fitted with RADAR or NKS locks can now be found in shopping centres, pubs, cafés, department stores, bus and train stations and many other locations in most parts of the country. 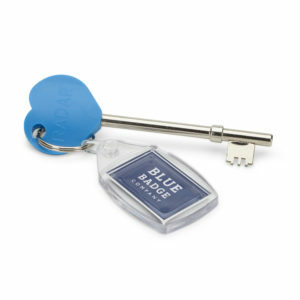 All our Keys are 100% Genuine and quality tested. This new Blue Heart Comfort Key has been launched by the RADAR lock manufacturers to distinguish it from replica keys that don’t work reliably, so you can be sure this Blue Heart Comfort Key will allow you access to a clean and functional toilet when you need it! Watch out for fakes, which won’t work properly and could damage locks.